IMAGE: The regulation of the enzyme ribonucleotide reductase allows for just the right levels of deoxynucleotides, the building blocks of DNA, to be produced in the cell. CAMBRIDGE, MA — Cell survival depends on having a plentiful and balanced pool of the four chemical building blocks that make up DNA — the deoxyribonucleosides deoxyadenosine, deoxyguanosine, deoxycytidine, and thymidine, often abbreviated as A, G, C, and T. However, if too many of these components pile up, or if their usual ratio is disrupted, that can be deadly for the cell. A new study from MIT chemists sheds light on a longstanding puzzle: how a single enzyme known as ribonucleotide reductase (RNR) generates all four of these building blocks and maintains the correct balance among them. Unlike RNR, most enzymes specialize in converting just one type of molecule to another, says Catherine Drennan, a professor of chemistry and biology at MIT. "Ribonucleotide reductase is very unusual. I've been fascinated with this question of how it actually works and how this enzyme's active site can be molded into four different shapes." Drennan and colleagues report in the journal eLife that RNR's interactions with its downstream products via a special effector site causes the enzyme to change its shape, determining which of the four DNA building blocks it will generate. While many other enzymes are controlled by effectors, this type of regulation usually turns enzyme activity up or down. "I can't think of any other examples of effector binding changing what the substrate is. This is just very unusual," Drennan says. The paper's lead author is former MIT graduate student Christina Zimanyi. Other authors are graduate students Percival Yang-Ting Chen and Gyunghoon Kang, and former graduate student Michael Funk. Deoxyribonucleotides are generated from ribonucleotides, which are the building blocks for RNAs — molecules that perform many important roles in gene expression. RNR, which catalyzes the conversion of ribonucleotides to deoxyribonucleotides, is an evolutionarily ancient enzyme that may have been responsible for the conversion of the earliest life forms, which were based on RNA, into DNA-based organisms, Drennan says. "There's no other enzyme that really can do that chemistry," she says. "It's the only one, and it's very different than most enzymes and has a lot of really unusual features." Previous studies have shown that RNR can take on different shapes, but it wasn't clear how those changes in configuration contributed to its specificity. 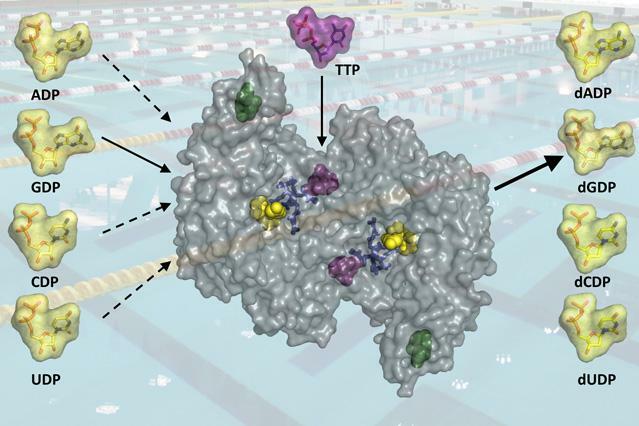 In the new study, the MIT team took X-ray crystallographic images of the enzyme as it interacted with all four ribonucleotide substrates, allowing the researchers to determine how its structure changes. They found that the enzyme's active site — the region that binds the substrate — changes shape depending on which effector molecule is bound to a distant site on the enzyme. For this enzyme, the effector molecules are deoxynucleoside trisphosphates such as deoxyadenosine triphosphate (dATP) or thymidine triphosphate (TTP). Depending on which of these effectors is bound to the distant regulatory site, the active site can accommodate one of the four ribounucleotide substrates. Effector binding promotes closing of part of the protein over the active site like a latch to lock in the substrate. If the wrong base is in the active site, the latch can't close and the substrate will diffuse out. "It's exquisitely designed so that if you have the wrong substrate in there, you can't close up the active site," Drennan says. "It's a really elegant set of movements that allows for this kind of molecular screening process." The effectors can also shut off production completely, by binding to a completely different site on the enzyme, if the pool of building blocks is getting too big. Because cancer cells need a large pool of DNA building blocks, scientists are interested in RNR as a target for chemotherapy drugs. There is now a handful of FDA-approved cancer drugs that interfere with RNR and thus deplete the deoxynucleotide pool, but the new findings may help researchers to design better RNR-targeting drugs, Drennan says. "It makes it now possible to think about doing more rational drug design than was possible before," Drennan says. RNR could also make a good target for antibacterial or antiviral drugs, she says, but for that to work, researchers would have to ensure that the drugs would not also target the human version of RNR. In this study Drennan focused on RNR from E. coli, but she is now investigating the human form of the enzyme. "My lab is interested in studying both human and bacterial RNRs, because I feel like we really need to understand whether they all work the same way, or whether there are going to be differences," she says.